One of the myths that continue to haunt us is the notion that Vatican II required a totally new architecture to provide for the radically new liturgy. This belief in a break, rather than in continuity, with the past has caused great damage to many of our historic churches, as well as encouraged unbridled experimentation in new ones. For the man or woman in the pew, a traditional church often accommodates the novus ordo Mass more reverently than most churches designed since the novus ordo was promulgated. Conversely, the majority of modern churches reflect a hermeneutic of discontinuity with the past and make it very difficult to celebrate the Mass of Blessed John XXIII. An important question for bishops, pastors, and architects today is how our new or renovated churches can support both the Mass of John XXIII and the Mass of Paul VI. Pope Benedict XVI’s motu proprio Summorum Pontificum makes clear that the laity or an individual priest have the right to attend or celebrate the traditional Mass. For those committed to the novus ordo, to the exclusion of the vetus ordo, it is important to point out that the architectural elements required by tradition neither prevent nor preclude the use of the church for the novus ordo (as can easily be seen by attending Mass at most of the great churches built by our forebears). In fact, these traditional artistic and architectural elements show the continuity between the two forms of the one Roman Rite. In order to accommodate both the ordinary and extraordinary forms of the Mass, our churches should have a prominently located and worthy altar with a footpace allowing the priest to stand in front of it facing ad orientem or ad Deum. The altar should be rectangular, raised on steps, and be wide enough for movement from side to side (this length is also beneficial for a Mass with concelebration). Benedict XVI has written about the significance of priest and people facing the same direction during the Mass, as traditional in the Mass of John XXIII but also allowed in the Mass of Paul VI. The baldacchino, as in the basilicas of Rome, can underscore the sacredness of a free-standing altar employed for both forms of the Roman Rite. The other element that is crucial to the celebration of the Mass of John XXIII is the altar rail, barbarically ripped out of many historic churches and banned by many liturgical experts. Churches that I have visited in Europe and America, where the faithful receive communion either standing or kneeling at the altar rail, allow the community to receive symbolically from the altar. This proximity, or at least the visual connection to the holy altar, expresses the symbolism of the altar rail as an extension of the altar and the centrality of the paschal sacrifice. A third element that would generously provide for priests wishing to celebrate the extraordinary form of the Mass in private or with a small group is the provision of side altars. American churches have often been very efficient in their design, resulting in the side altar formula of Mary to the left and Joseph to the right of the sanctuary. However, there are many other solutions for both new and existing churches, such as an altar along a side aisle, or in the transept, or even a spatially separate side chapel, all of which can become places of devotion for the faithful and even serve as a daily Mass chapel. 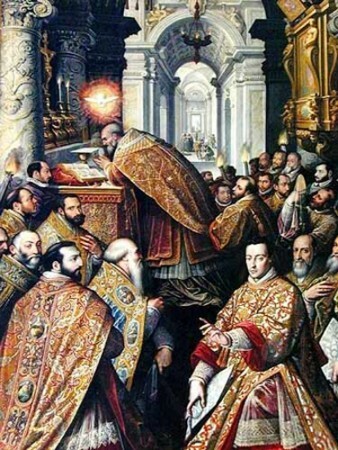 As we build anew or renovate our churches to accommodate the extraordinary form of the Roman Rite, we will find that these three elements (along with others) will increase the sacredness of our church architecture and in turn support awe and reverence in the celebration of the ordinary form of the Mass. As many realize, the architectural patrimony of the Church is rich and varied, and it offers many lessons for the inspiration of modern man and the support of the most holy liturgy, both ordinary and extraordinary.